Whether or not we like it, stress is a part of our day-to-day lives. It’s important to know how to relieve stress so that it doesn’t take a toll on your mental health. If you’re feeling stressed out, we get it. Here are nine stress relief tips. 1. Clear your schedule. When we’re experiencing stress, it can be easy to feel like we’re struggling to keep up. If stress is getting to you, work on cutting down the commitments in your life. Making space in your schedule will make things feel less rushed and give back your sense of control. 2. Incorporate some mindfulness. If you’re not able to clear your schedule, find ways to take mental breaks during your day. Breathing techniques and mindfulness exercises are an easy way to relieve your stress, even if you’re sitting at a desk. Our favorite? This breathing GIF. 3. Lean into your physical health. According to the The American Institute for Stress, 77% of people experience regular physical symptoms related to stress. Physical activity is a great method of stress relief. Simple activities like taking a ten minute walk can make a huge difference. 4. Reach into your self care kit. Ideally, self care should be part of your regular mental health routine. But when you’re feeling stressed out, self care is even more important. Be extra aggressive about utilizing your self care toolkit in order to relieve your stress. Not sure where to start? Check out our Beginner’s Guide to Self Care. 5. Get enough sleep. Sleep is one of the building blocks for maintaining our physical and mental health. Protect your sleep when you’re feeling stressed. If you’re having trouble sleeping, there are great online tools like white noise and sleep podcasts that you can try out for free. 6. Connect with family and friends. Social supports can make a big difference on how we handle stress. Fifty-seven percent of people turn to friends or family to help them manage their stress, according to the American Psychological Association. Lean into the important people in your life and ask for help when you need it. Need someone to talk to? 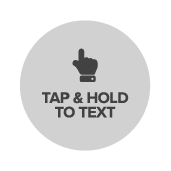 Text a Crisis Counselor at 741741 or use the mobile click to text button. We’re here for you. 7. Cut back on unhealthy coping mechanisms. We all have guilty pleasures that we indulge in occasionally. But when we need stress relief, it’s crucial to focus on healthy coping mechanisms. 8. Invest in some new hobbies. Channel your stress and worry into learning a new activity or hobby. Even if it just acts as a distraction, a hobby can be a great way to spend the free time that you might have spend worrying. 9. Get help from an expert. If stress is starting to interfere with your day-to-day life, it might be time to seek out a medical advice. Talk to a general practitioner or a mental health professional. For other resources, check out Crisis Text Line’s referrals. Stress will always be a part of our lives. With some work, we can manage it and make sure it doesn’t take over our lives.